A marriage is the ceremony in which two people are united. Marriage traditions and customs vary greatly between cultures, religions, countries, and societies. The Hindu Marriage consist of following ceremonies. 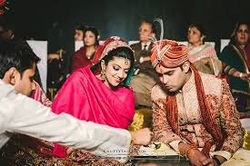 During Marriage ceremony under a beautiful Mandap the following rituals are being performed. Vedic Brahmins from Bride and Groom side chant the Vedic mantra. Madhuparka Ceremony - Reception of the bridegroom at the altar and bestowing of presents by the bride's father. Kanya Dan - The bride's father gives away his daughter to the groom amidst the chanting of sacred mantras. Vivah-Homa - The sacred fire ceremony ascertaining that all auspicious undertakings are begun in an atmosphere of purity and spirituality. Pani-Grahan - The groom takes the right hand of the bride in his left hand and accepts her as his lawfully wedded wife. Pratigna-Karan - The couple walk round the fire, the bride leading and take solemn vows of loyalty, steadfast love and life-long fidelity to each other. Shila Arohan - The mother of the bride assists her to step onto a stone slab and counsels her to prepare herself for a new life. Laja-Homah - Puffed rice offered as oblations into the sacred fire by the bride while keeping the palms of her hands over those of the groom. Parikrama or Pradakshina or Mangal Fera - The couple circles the sacred fire seven times. In first four circles Bride leads followed by groom and in last three circles Groom leads and Bride follows .This aspect of the ceremony legalizes the marriage according to the Hindu Marriage Act as well custom. Saptapadi - Marriage knot symbolized by tying one end of the groom's scarf with the bride's dress. Then they take seven steps representing nourishment, strength, prosperity, happiness, progeny, long life and harmony and understanding, respectively. Sapt Vachan( Seven Bounds): Bride and Groom takes oath to fulfill the promises of each other during life. These seven promises is being chanted by Brahmins from both sides . Abhishek - Sprinkling of water by Brahmin and seeing of the Sun or the pole star if marriage is conducted during Day or Night respectively. Please contact Acharya Ji for the fixation of correct marriage Mahurat. Acharya ji Performs the marriage Ceremony Services as per North Indian Style in entire country. Download Marriage Ceremony Samagree List.